The Russian Proton rocket blasted off on Dec. 11, 2011 from the Baikonur Cosmodrome in Kazakhstan. An Israeli-owned telecommunications bird and a Russian data relay satellite that will route communications with the International Space Station and other low-Earth-orbiting spacecraft shared a Proton rocket ride Sunday (Dec. 11). The Amos 5 and Luch 5A satellites roared off the snowy launch pad aboard a Proton rocket equipped with a Breeze M upper stage at 1117 GMT (6:17 a.m. EST) from the Baikonur Cosmodrome in Kazakhstan. Unlike other commercial Proton flights managed by U.S.-based International Launch Services, the mission Sunday was a Russian government operation for the Khrunichev-built booster. It was the 372nd Proton rocket launch since 1965, the 9th this year and the third in the past three years to carry two communications satellites stacked atop each other in a dual-deployment. 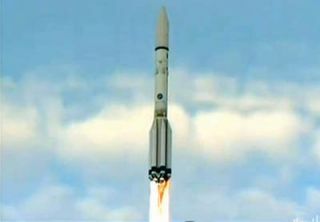 Soaring into a preliminary orbit within 15 minutes after the Proton's three lower stages fired in sequence and an initial burn by the upper stage, the flight began several trips around the world over several hours as the Breeze M motor systematically maneuvered the payloads higher and higher. Similar in concept to NASA's Tracking and Data Relay Satellite System, the Luch 5A will operate 22,300 miles above Earth to provide connections to lower-orbiting spacecraft beneath it, like the Russian segment of the International Space Station and the country's other satellites when they are flying outside of ground-based tracking stations. Russia's previous generations of data relay satellites have gone out of service due to age. Sunday's launch is meant to recreate that utility and give Russian flight controllers more visibility to space assets when they are outside the very limited coverage area of ground-tracking sites. The country has available orbital slots at 16 degrees West longitude over the Atlantic, 95 degrees East over the Indian Ocean and 167 degrees East over the Pacific to operate the satellite. The Luch 5B is slated to go up next year. Manufactured by Reshetnev Information Satellite Systems Co., Luch 5A has high-gain, steerable and omnidirectional antennas to communicate in Ku- and S-band frequencies for routing telemetry signals, relaying commands to spacecraft and tracking rocket boosters in flight. The craft weighed approximately 2,500 pounds at launch and has a 10-year design life. The lower passenger aboard the Proton's satellite stack was Amos 5, the latest spacecraft in the growing communications fleet for Israeli operator Space-Communication Ltd. of Tel Aviv. The 3,500-pound bird separated from the Breeze M upper stage nearly 10 hours after liftoff at 2052 GMT (3:52 p.m. EST) to successfully complete the day's ascent. Better known as Spacecom, the firm already operates a pair of satellites providing direct-to-home television, video distribution and broadband Internet services across the Middle East and Europe, with a western reach over the Atlantic to shores of North America. Now, the new Amos 5 spacecraft will go into service at the 17-degree East location in geostationary orbit to grab a share of the emerging satellite services market in Africa. Built by Russia's Reshetnev Information Satellite Systems Co., the satellite is outfitted with C- and Ku-band transmission beams to blanket Africa and connect with Europe and the Middle East. Direct television broadcasting, cellular telephone routing and Internet are among the services to be offered through Amos 5, which has 18 C-band and 18 Ku-band transponders and a 15-year service life. The next and final Proton launch of the year will be a commercial ILS mission with the SES 4 satellite that is headed for an orbital parking spot above the Atlantic to provide telecommunications services to the Americas, Africa, Europe and the Middle East. Liftoff is targeted for Dec. 26 from Baikonur.